This year, I decided to bake a slightly different log cake – one that is less sinful but still has the appearance of a log cake. I happened to chance upon a very interesting recipe book, written by Junko. 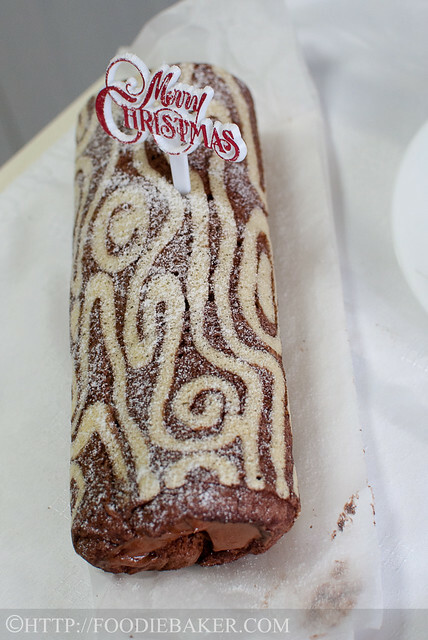 Junko creates these very pretty patterned swiss roll cakes, which I’ve linked at the bottom. I was amazed and totally inspired by her cakes, so I used Junko’s idea and baked a “wooden” log cake. Combine egg yolks and sugar in a medium bowl. Beat with an electric mixer until thick and pale. Add in water and oil and beat it in. Add in vanilla extract / paste and beat it in as well. Sift in flour mixture and beat it in. Scoop a little egg yolk batter into a small bowl. Beat an egg white till stiff peaks formed. Fold in some egg whites into the small amount of egg yolk batter. Pipe the log pattern onto a baking sheet. Bake until the egg yolk batter has set. Sift in cocoa powder into the remaining egg yolk batter and beat it in. Fold in the egg whites in 3 batches. Pour the batter over the baked egg yolk batter and bake till done. 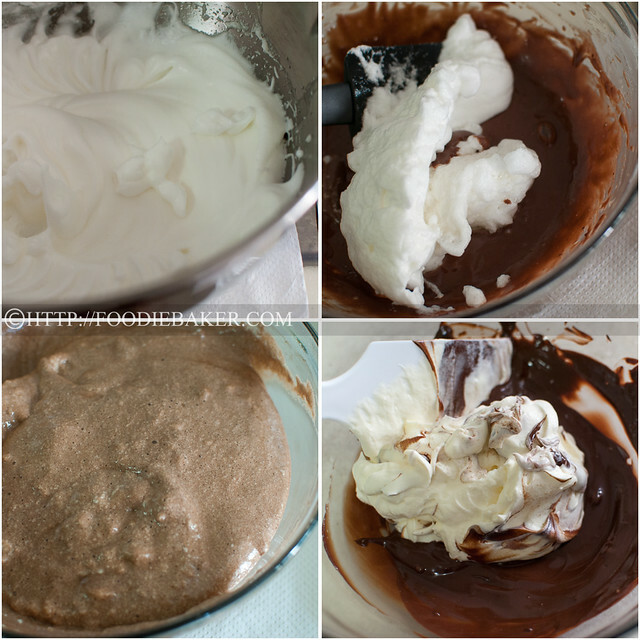 Make the chocolate mousse by folding some whipped cream into melted chocolate. Fill the genoise with the chocolate mousse, roll, and serve! 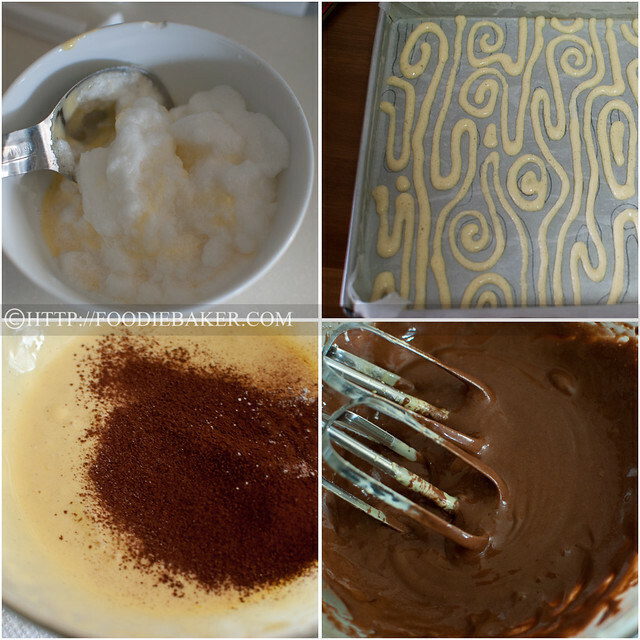 I’m submitting this to Aspiring Bakers #26 – Creative Christmas Motif Bakes! hosted by Alan of Travellingfoodies. Preheat the oven to 170 degrees Celsius. Butter a 10-inch baking pan and line the bottom and sides with baking parchment. Rub the baking parchment lightly with a layer of vegetable oil. Set the baking pan aside. Place the egg yolks and sugar in a large bowl. Beat with an electric mixer until thick and pale. Add in water, vegetable oil and vanilla and beat it in. Sift in 60 grams of plain flour and 10 grams corn flour and beat it in till the batter is thick and leaves a trail when you lift up the beaters. Scoop 1 tablespoon of the egg yolk batter into a small bowl and fold in ½ teaspoon plain flour. Sift the cocoa powder into the large bowl of egg yolk batter and fold it in. 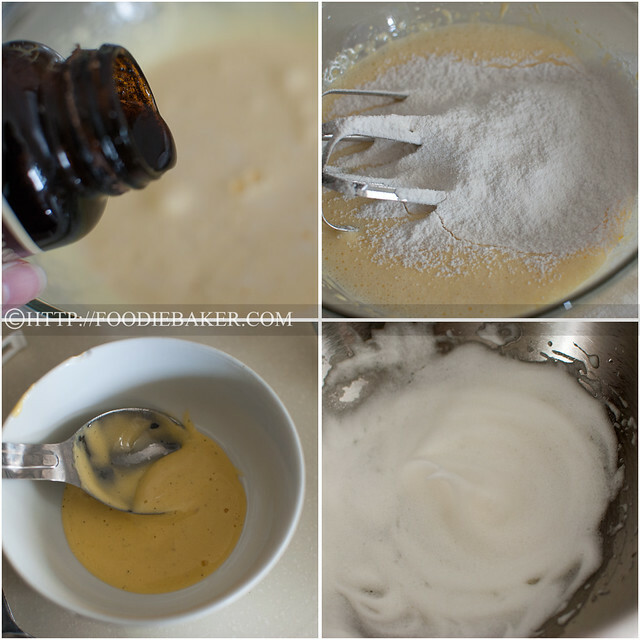 Place the egg white in a clean, large bowl (dry and oil-free) and beat until the egg white is foamy. Add in the pinch of corn flour and beat until the egg white forms stiff peaks. Fold ⅔ of the egg whites into the small bowl of egg yolk batter. Fold the remaining egg white into the large bowl of egg yolk batter. 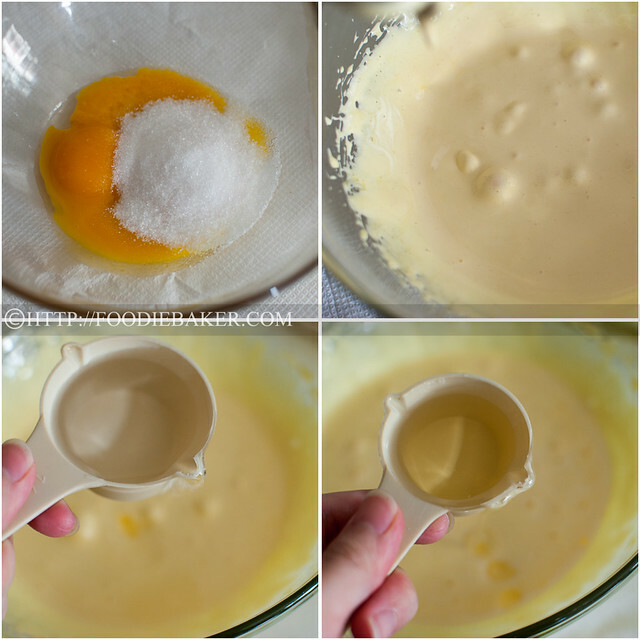 Transfer the small bowl of egg yolk batter into a piping bag. Pipe a log design onto the baking parchment. Bake for 2 minutes until the batter has dried up slightly. Set aside on a wire rack. Place the egg whites in a large bowl (you can use the same bowl used to beat the egg white previously) . Beat with an electric mixer till foamy. Add in the sugar and corn flour and beat till stiff peaks formed. Fold the stiff egg whites into the egg yolk batter in 3 parts until no trace of egg whites is left. Transfer the batter onto the baking pan and spread it evenly. Rap the baking pan 2 to 3 times on the table counter to get rid of excess air bubbles. Bake for 15 to 20 minutes until the genoise bounced back slightly when touched or when a skewer inserted into the centre of the genoise comes out clean. Invert the genoise out onto a large baking sheet. Peel off the baking parchment and turn the genoise right side up. Roll up the genoise and leave it to cool completely on a wire rack. Fold the whipped cream into the melted and cooled chocolate. Unroll the genoise, spread it with chocolate mousse and roll it up. Refrigerate till the log cake is well-chilled. Dust with icing sugar and serve. Anyways Have a Prosperous New Year to you and your family! Thank you Liz! Hope you had a lovely Christmas. Take care! Thank you for the compliments Lena! Hope the coming year bring lots of wonderful things to you and your family, take care! Thank you Karen! I think I have to attribute it to… Beginner’s luck? I’m sure you can make it better than me! Hope you had a lovely Christmas! Happy new year and take care! Thank you so much Maria! I hope you had a great Christmas with your family 🙂 may all wonderful things come your way in the coming new year! Hope you get around making it soon! Can’t wait to see it on your blog. Happy new year! 🙂 take care! Hi Hui! Thank you! I also feel less guilty eating it, so do give it a try when you feel less lazy 😉 hope your Christmas was good and happy new year! Hi Amelia, thank you! Hope you had a great Christmas, happy new year! Oh thank you Bobbi, your comment just made my day. Hope you had a lovely Christmas. May even more lovely things come your way in the coming new year! Thank you for your compliments! I’m sure you can do it too, it’s not as difficult as it seems, only a little tedious! 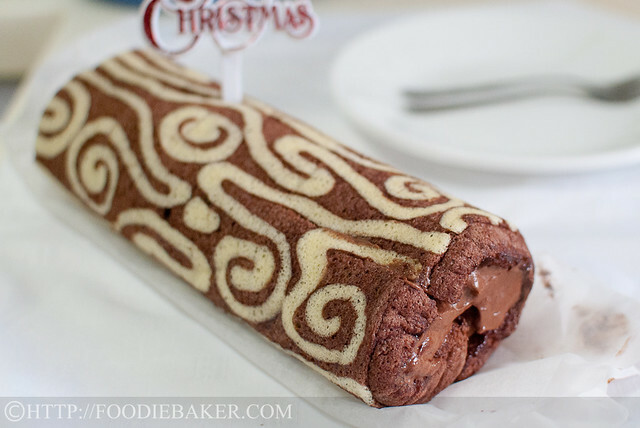 Your patterned swiss roll is beautiful. Wishing you a Merry Christmas, Jasline! Two stunning cakes! What a marvelous holiday tradition you’ve started 🙂 Merry Christmas!!! this is really one impressive and beautiful wooden log design. Well done, Jasline! Here’s wishing you a Merry Christmas and have a wonderful great new year 2013! What a beautiful cake…I would have thought you had made this many times. Have a wonderful Christmas. Hi Jasline. Thanks for all those wonderful recipes that you bring to us. This one is completely amazing, I love it. I really wish a Merry Christmas for you and your family. I’ve always wanted to try my hand at making a yule log. Maybe I’ll try for New Year’s. Merry Christmas! Hi Jasline ,wow…. 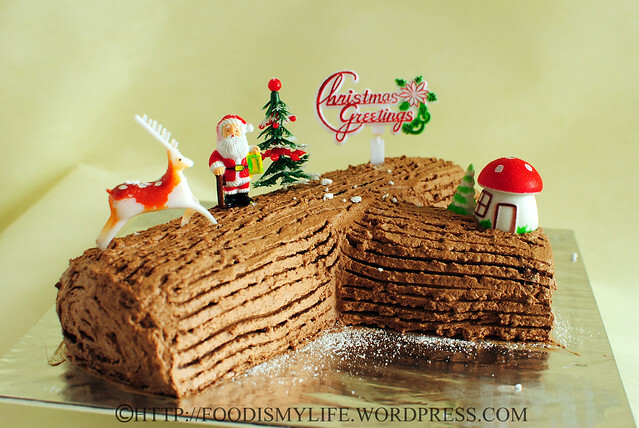 love your Christmas log cake. Look so cute and pretty. Well done! You’re very creative. Merry Christmas and Happy New Year to you. Happy holiday. So amazing! Beyond my skill set, though. Bet it tastes gooooood. Awww thank you so much, you flatter me, John! Have a Merry Christmas and a wonderful 2013! Take care! Thank you for your compliments! We all love the chocolate filling, if the cake is a bit softer it’d be perfect! 🙂 Merry Christmas to you and your family too! Thank you for the compliments 🙂 Merry Christmas to you and your family too! I’ve also made a note in my recipe about the cookbook. Thank you! Hi Balvinder, sorry! I forgot to mention that the book is in Japanese. They have a translated version in Chinese, but I’ve not seen an English translated version yet… hope my post will help! Merry Christmas to you and your family! “Not bad” for your first attempt?!?!?! This is a very pretty cake, Jasline. One that most would be proud to serve with Christmas Dinner. Well done! Happy holidays and every happiness in 2013. 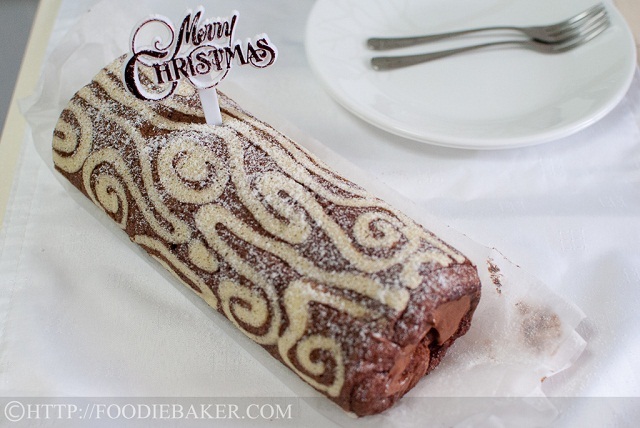 Love the use of vanilla genoise for that wonderful Christmassy feel to the log. Very beautiful. And I bet it tastes great! Merry Christmas (if you celebrate) and here’s to a great New Year! This is very impressive! 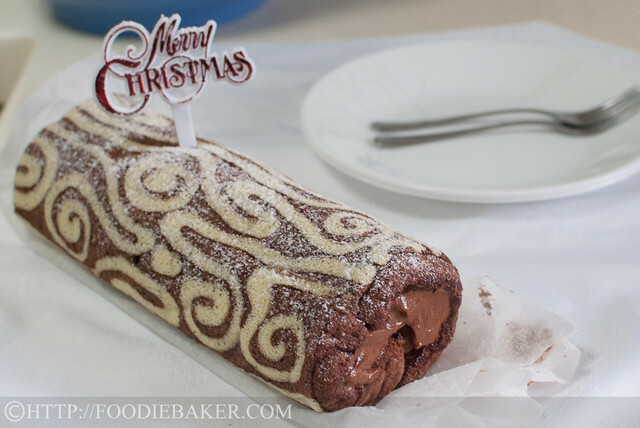 I love roulade cakes and I am inspired to make this. I clicked on the link provided but I do not know Japanese. I looked for translation on that blog but could not find it but anyways your tutorial is good enough to start. Have a good Sunday! Wow, seriously beautiful log. I love your technique and the result is outstanding. So festive and perfect for the holidays.